PRINCETON, N.J. -- Barely half of U.S. voters think their own member of Congress deserves re-election, and just 27% say most members deserve another turn. These findings are on par with voters' attitudes in October 2014 and slightly improved from the historically weak levels seen in early 2014 but otherwise are among the weakest for incumbents since 1992. 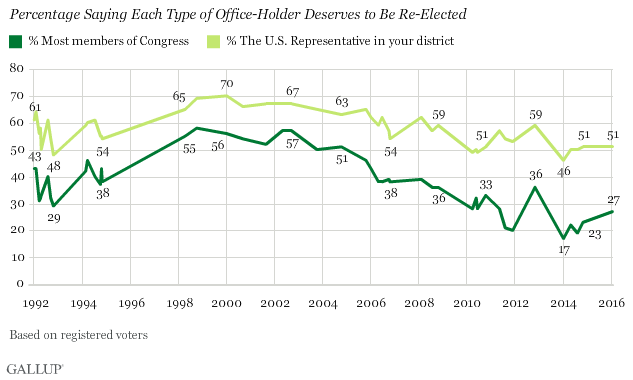 Voters' support for congressional incumbents' re-election has been relatively low since 2006. Since then, voters' belief that most members deserve re-election continued to decline through 2014 while their support for their own members' re-election has steadied between 51% and 59%. Support for members of Congress on both measures exceeded 50% from 1998 through 2004 -- a period of relative prosperity and solid support for governmental leaders in the years following the 9/11 attacks. This environment was good for congressional Republicans, who were able to maintain their majorities over this period with ease. However, in years just before -- 1992 and 1994 -- Gallup recorded another low point in public support for incumbents with 38% of U.S. adults saying most members of Congress deserved re-election in November 1994, likely contributing to the GOP takeover in that year's midterm elections. The 2016 figures are based on a Jan. 21-25 Gallup poll. 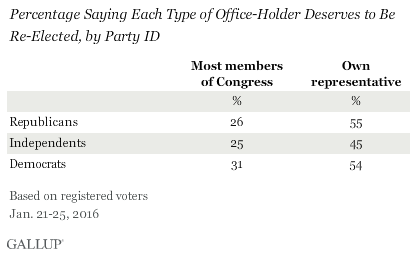 Despite the current Republican majority in Congress -- and mirroring the recent political parity seen in approval of Congress -- rank-and-file Republicans and Democrats have similar views about whether their own member, as well as most members, should be re-elected. 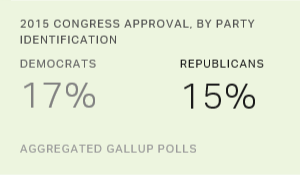 The historically low levels of Americans saying that their own and most members deserve re-election reflect Congress' dismal job rating, mostly registering at or below 20% in Gallup's monthly polling for the past five years. If the anti-incumbent mood continues into the fall, Congress could see relatively high turnover, similar to 1992 and 2010 when fewer than 93% of incumbents were re-elected. On the other hand, incumbents did quite well in 2014 -- with a 95% re-election rate in the House -- in spite of historically low "deserves to be re-elected" numbers. The turnover that did occur was all in the Republicans' favor. When anti-incumbency fervor coincides with a presidential year, the other possibility is that the losing party in the presidential race takes the brunt of the seat losses, which happened to Republicans in 2008. 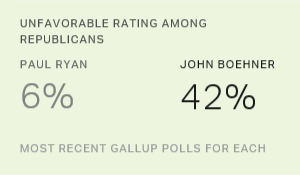 And while that's not a guarantee, the heft of the Republicans' current majority means the GOP has the most to lose from the public's desire for change in Congress. Results for this Gallup poll are based on telephone interviews conducted Jan. 21-25, 2016, with a random sample of 1,022 adults, aged 18 and older, living in all 50 U.S. states and the District of Columbia. For results based on the total sample of 903 registered voters, the margin of sampling error is ±4 percentage points at the 95% confidence level. All reported margins of sampling error include computed design effects for weighting. Four in 10 Americans rate the current situation in the U.S. as positive, below the historical average. Americans have grown more negative in their views of the nation's situation five years ago, but are now more optimistic about its future. On average, 16% of Americans approved of the job Congress was doing throughout 2015, just two percentage points above the all-time low in 2013. This marks the sixth consecutive year Congress' approval ratings have been below 20%.